I was lucky enough to receive some "Creamer" potatoes to try from The Little Potato Company. 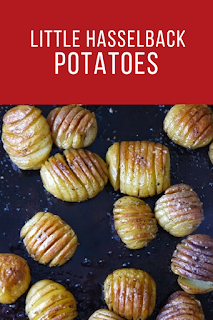 The Baby Boomer variety is a tiny, yellow-fleshed potato that's great for roasting, so I thought I'd turn them into mini hasselback potatoes. Hasselback potatoes is a Swedish potato recipe where thin slices are cut almost all the way through, but the potatoes stay whole, so you get crispy crackles on top, but have creamy roasted middles. The best of all potato worlds. Normally these are made with full-sized potatoes, but these baby potatoes made a perfect side dish. It's a little fiddly to cut the slices in all these little potatoes, but it doesn't take long and the results are more than worth the effort. This is about 1.5 pounds of potatoes. To make it easier I placed each potato in a wooden spoon as a guide so I wouldn't cut all the way through. I used a very sharp paring knife to make slices 3/4 of the way through, leaving the bottom intact. Make the slices as close together as you can. Slice all the potatoes like this. They don't look like much now, but just wait! Preheat the oven to 400 degrees and place a baking sheet inside. Once the oven and the pan are preheated, add 3 tablespoons of olive oil and 1 tablespoon of butter to the hot pan and place it back in the oven for about 3-4 minutes until the butter melts and the oil is hot. Add the potatoes to the hot pan and toss them around until they're covered in oil. Sprinkle with salt and pepper. Roast the potatoes for 40 minutes, shaking the pan and flipping the potatoes occasionally to brown all sides. As the potatoes brown, the cuts will split open and become dark and crispy. These would be fantastic as a passed appetizer at a cocktail party. A little dollop of sour cream and a sprinkle of chives on top would make them all fancy. But I served them with roast chicken and they made an amazing side dish. We gobbled them all up between the two of us and wished there were more!